Marwan Barghouti is a murderer currently serving five consecutive life terms (plus 40 years) in an Israeli prison for his 2004 conviction on multiple charges relating to the killing of five civilians during the Second Intifada. The court determined that “Barghouti was responsible for providing the field units with money and arms” and that the attacks were often “based on instructions” he received personally from Yasser Arafat. As CAMERA has reported, Barghouti was also widely considered one of the main leaders in the Palestinian campaign of violence during the Second Intifada and helped found and then lead the Fatah-based militias which carried out numerous suicide bombings. He’s also a Guardian contributor. Barghouti, in his Oct. 11th op-ed, commented on the recent Palestinian “uprising” which has killed five Israelis and injured many more. Whilst Barghouti has previously explicitly expressed his support for terrorism, as “the only way to end the occupation”, his Guardian op-ed avoids explicitly endorsing terror (evidently out of a wish not to offend British sensibilities), though implicitly suggests that this is the Palestinians’ only alternative. This new Palestinian generation has not awaited reconciliation talks to embody a national unity that political parties have failed to achieve, but has risen above political divides and geographic fragmentation. It has not awaited instructions to uphold its right, and its duty, to resist this occupation. Then Marghouti proceeds to misinform readers about the nature of the recent Palestinian ‘resistance’. Of course, this is just a lie. The recent terror surge has been characterized by Palestinian attacks against Israelis using knives, guns and firebombs. Tellingly, Guardian reporters and editors have stamped their approval on Marghouti’s deception. Their Jerusalem correspondent, Peter Beaumont, devoted a story to celebrating Marghouti’s Guardian op-ed. Beaumont described the convicted murderer as “a hugely important Palestinian political figure”, his op-ed as “impassioned”, and proceeds to run interference for Barghouti by failing to mention his continued support for terror. Not to be outdone was the Guardian’s Middle East editor, Ian Black, who shared the following on Twitter. Note the curious decision by Black to add the hashtag #Intifada, presumably to generate interest in the op-ed among the radical, pro-“resistance” crowd. There are quite a few factors which lead us to believe that many Guardian reporters and editors will likely lend moral support to the Palestinians in the event they launch another deadly intifada. Specifically, the paper has shown a clear tendency in the past to license extremist commentators who reject peace and reconciliation with Israel and legitimize (if not justify) Palestinian terrorism. Additionally, their binary moral paradigm in which Palestinians are seen as immutable victims of Israeli oppression further necessitates at least tacit support for the Palestinians’ recourse to violence. The Guardian’s decision to publish an op-ed by an unrepentant Palestinian terrorists responsible for the murder of several civilians, and the promotion of that piece by their Jerusalem correspondent and Middle East editor, serves as additional evidence that the media group can indeed be expected to provide moral cover for the next coordinated Palestinian onslaught against innocent Jews. The whole of the Middle East is in turmoil. In Syria, Iraq, Yemen and Libya there are ongoing wars involving millions of people resulting in hundreds of thousands of civilian deaths, maimings and refugees. By comparison the situation in Israel and the territories is far less inflammatory despite recent events. Nonetheless the mediocrities that report on such matters for The Guardian appear to encourage even more war, violence and insurrection. It is as if that which transpires elsewhere in the region is insufficient for their appetites. Quite aside from the obvious Antisemitic undertones their contributions are essentially evil and banal in that they glorify war and death. Did the Guardian contrivance he was convicted of killing at least one person who wasn’t a Jew? Surely this is a much more serious crime in their eyes. Oops – ‘notice’, not ‘contrivance’! If the news got out that the Palestinian refugees are the victims of the Arab League and that far more were made refugees from the Arab League member states also started in 1948, maybe we could begin to heal. It’s on public record that the two refugee issues should be negotiated together. oops the second group, those expelled or forced to leave, were the 850,000 Mizrachi Jews from the Muslim states. The lands stolen from them are several times the size of Israel. Emmanuel : HOW would that SOLVE the problem? after a billion words you want to add up another billion words and keep the 3 million arabs squatting the jewish provinces? you can talk as much as you want that would change nothing except there are more chances Israel is destroyed at the end. Haven’t we already seen what Marwan Barghouti does with freedom when he has it? Get your heads out of your asses already. This jerk isn’t in prison because he’s a freedom fighter, he’s in prison because he’s a murderer. It’s where he belongs for the rest of his natural life. That you give him space in your paper for his demented rantings is an embarrassment to intellect and morality, and illustrates your paucity of ethics and good judgement. guardian does not cover events in Mid East it participates in terror against Israel. It tries to replace jewish population with an arab population by means of pressures. Israel’s ‘leaders” help them by refusing to claim claim sovereignty over the jewish provinces calling them “palestinian territories”(sic.) anbd refusing to transfer arabs to jordan which would END THE CONFLICT. 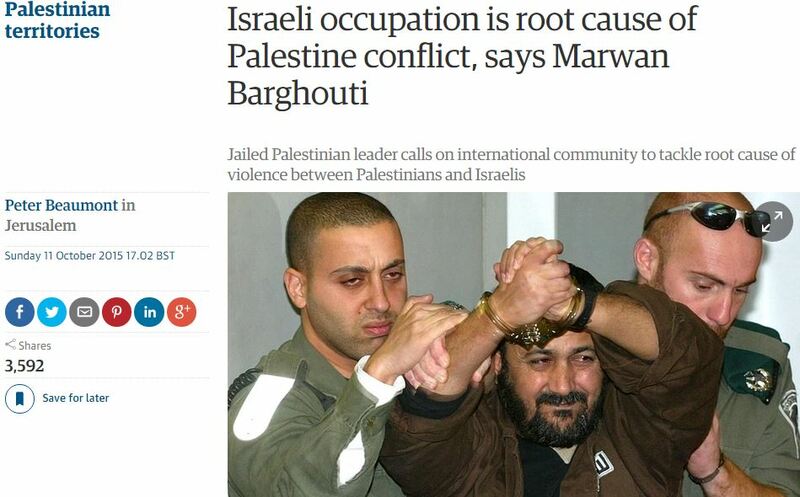 Great article below about this Arab terrorist Marwan Barghouti the Guardian supports. Why should Barghouti enjoy the freedom that he denied Yosef Habi, who was enjoying a night out in Tel Aviv with his wife, Haya? Barghouti’s assassins first shot Haya, and then Yosef ran to her rescue shouting “Don’t shoot!” but the terrorists killed him anyway. 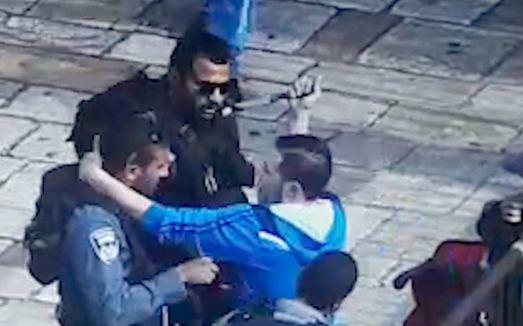 Now Yosef’s son Itzik and daughter Sima will never hug him again.